Mix, whisk, and knead with the improved design of the BLACK+DECKER™ Versatile 5-Speed Hand Mixer. 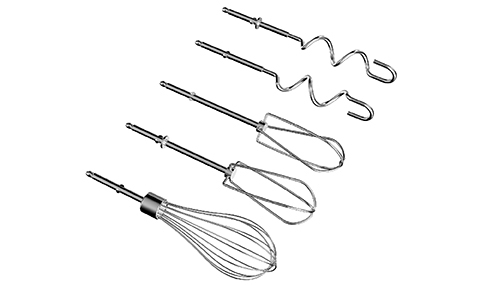 This set includes two professional-style beaters, two dough hooks, and one chef's whisk; allowing you to quickly create cake and cookie batters, bread doughs, spreads and dips, homemade whipped cream, or whipped egg whites for a tasty meringue. The 250-watt motor runs at five speeds, including a 20% slower* starting speed that keeps your countertop splatter-free. Plus, a special turbo boost increases the mixer to maximum speed to combine thick ingredients in no time. All accessories are stored conveniently in the smartly designed storage case, which uses the mixer itself as the snap-on cover. Cleanup is a breeze with the auto-eject button that quickly disconnects the dishwasher-safe mixing tools. Plus, you can further prevent messes with the bowl rest, which allows the mixer to sit upright on the edge of the bowl. Prevent a mess and start every mixing task on the 25% slower* first speed then slowly increase speed for optimal mixing consistency – there’s a speed for every mixing task! Go to max speed to get the job done quick! 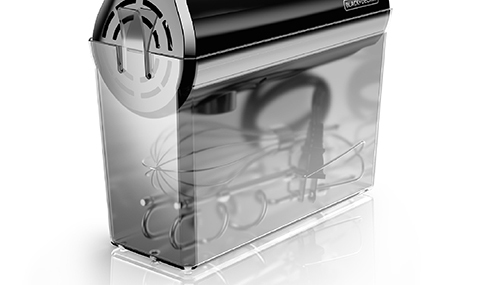 The turbo boost button automatically increases the mixer to top speed for tough mixing tasks. This complete mixing set includes: two professional- style beaters, two dough hooks, and one chef’s whisk. Keep everything in one place! The snap-on storage case comfortably holds all five attachments and the cord. Versatile 5-Speed 250 Watt Hand Mixer is rated 4.4 out of 5 by 51. 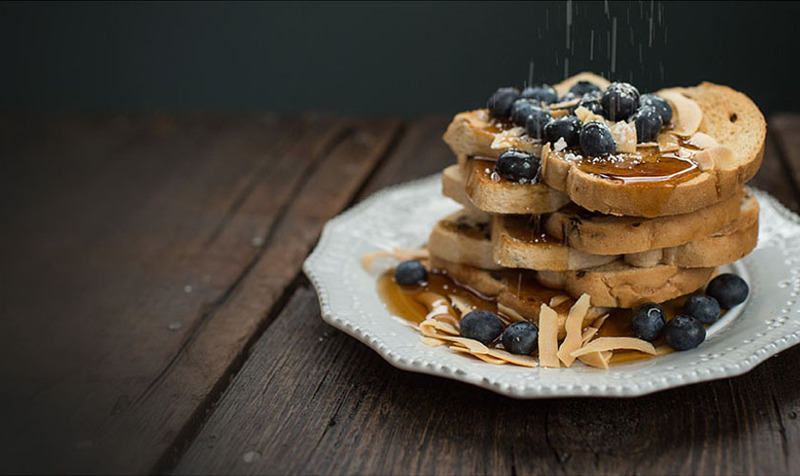 Rated 1 out of 5 by Marie615 from Broke after a few times Was excited to get a compact appliance with the various attachments that are dishwasher safe. Used about 3 or 4 times and the plastic inside the hand held portion broke, rendering it useless. Like to get a replacement. 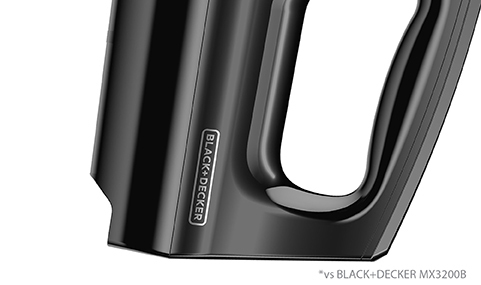 Typically Black and Decker is my go to brand in appliances, and extremely disappointed with this. Rated 5 out of 5 by Nanamomma from This is the best mixer I have ever used! The low speed is powerful, but doesn't sling stuff everywhere. The high speed is so fast and smooth! I really like this mixer. Rated 2 out of 5 by briank from The "helix" attachments don't work well I was hoping this would be a good mixer, and it's not totally bad, as the dough hooks work well, but the "helix" attachments are pretty useless, as they fling what you're mixing and don't really do well at chopping any solids. I wish I could get normal ones...then the mixer would be great. Rated 5 out of 5 by Oma78 from Perfect Back-up This was a gift to me to use when my stand mixer is in use, but I need a mixer. I love it!! I especially love the compact storage unit which keeps all the parts in one place. My case has broken (fell on the floor with force) and I would like to know if I might purchase another. Rated 2 out of 5 by liz2000 from good I just wondering why only come with 1 chef's whisk?? Rated 1 out of 5 by Unhappy D from unhappy I bought this to replace a broken mixer thinking "hey, black & decker, they're reliable". I do not like the beaters. They do not mix well. Takes a lot of effort on my part. My whipped potatoes never had pieces before. Took forever to mix cookie batter. I contacted them but got no response. So I am giving it away. Won't buy another one from them. Rated 4 out of 5 by Kris21108 from Great mixer! I have had this mixer for a pretty long time but I am just now writing a review because although I cook a fair amount I don't bake as often and just started using it. I've had several mixers over the years but I really like this one. I love how light it is -- past hand mixers have felt really heavy which made it harder to use. As someone who doesn't enjoy baking as much as cooking I was worried that I was going to be wasting my time on this product but now that I have used it a couple of times I am sort of hooked! Not only is it a great product but it is a Black and Decker so you know you are getting quality! I would def. recommend this to anyone looking for a new hand mixer! Rated 5 out of 5 by Mandy from So versitile! Amazing product! There are so many different features and so easy to clean. It is definitely a staple ony counter! Does it work for dual voltage?like 220v and 110 v both? Can I purchase replacement attachments for this mixer? How do I register this product ? What would cause only 1 beater to turn an not the other?